There are 66 Assisted Living Facilities in the Kenmore area, with 3 in Kenmore and 63 nearby. The average cost of assisted living in Kenmore is $3,500 per month. This is higher than the national median of $3,346. Cheaper nearby regions include Bothell with an average starting cost of $2,635. To help you with your search, browse the 317 reviews below for assisted living facilities in Kenmore. On average, consumers rate assisted living in Kenmore 4.3 out of 5 stars. Better rated regions include Mountlake Terrace with an average rating of 4.4 out of 5 stars. Caring.com has helped thousands of families find high-quality senior care. To speak with one of our Family Advisors about assisted living options and costs in Kenmore, call (855) 863-8283. In a recent study, Kenmore ranked number one among America's Best Cities for a Healthy Retirement, meaning that it received high scores for wellness, access to medical services and satisfaction with the city's overall quality of life. For retirees considering assisted living, the Kenmore area offers 56 different facilities from which to choose, with three in Kenmore and 53 more in surrounding towns including Bothell, Kirkland and Mountlake Terrace. The Washington State Department of Social and Health Services (DSHS) licenses all of these assisted living facilities (ALFs) to provide personal care services for residents. Seniors seeking a temperate climate will appreciate Kenmore's mild winters and warm, dry summers. The city's comfort index is 78 out of a 100, indicating that it is more comfortable than the average U.S. city, which scores only 54. Kenmore offers seniors a slightly more affordable alternative to the neighboring city of Seattle. Seattle's cost of living is 104 percent above the national median; by comparison, Kenmore's living costs are only 91.2 percent higher than the U.S. average. Washington has one of the most retiree-friendly tax policies of any state in the U.S. Because there is no state income tax, all types of retirement income are tax-free. The Kenmore area boasts a variety of cultural and outdoor activities that seniors may enjoy, from parks and golf courses to the Kenmore Art Gallery and the Northshore Performing Arts Center. Kenmore has an array of community resources for seniors, including Aging and Disability Services, an organization that helps link seniors to available resources, as well as two senior centers. The Kenmore area is home to world-class medical facilities, including EvergreenHealth Medical Center, in the event of medical emergencies or illness. Assisted Living costs in Kenmore start around $3,500 per month on average, while the nationwide average cost of assisted living is $4,000 per month, according to the latest figures from Genworth’s Cost of Care Survey. It’s important to note that assisted living rates in Kenmore and the surrounding suburbs can vary widely based on factors such as location, the level of care needed, apartment size and the types of amenities offered at each community. 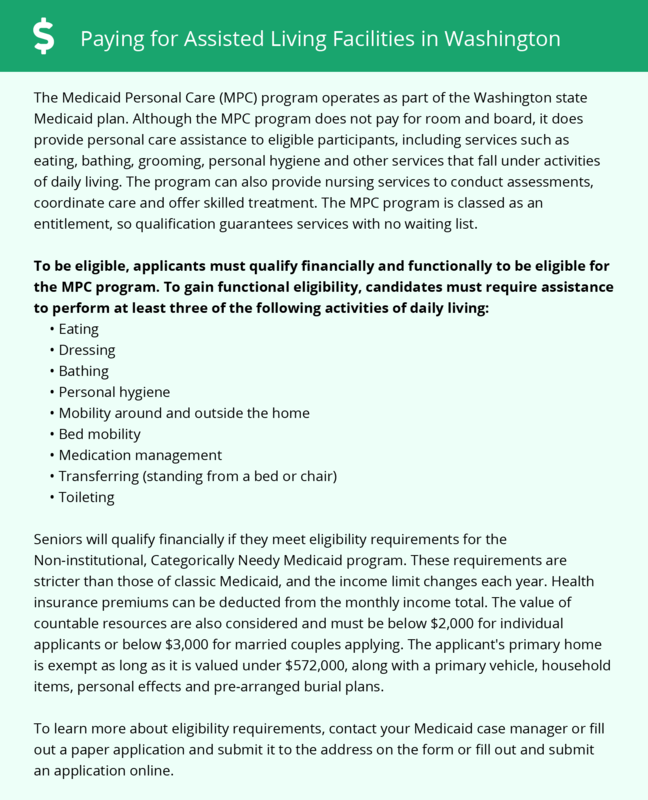 Washington's state Medicaid program, called Apple Health, offers financial assistance that may help low-income persons pay for assisted living. Programs include the Community First Choice Option (CFCO), the Medicaid Personal Care (MPC) program and the Community Options Program Entry System (COPES) waiver. Because some facilities do not accept payments from the state, it is a good idea to check with individual facilities regarding their policies. Kenmore and the surrounding area are home to numerous government agencies and non-profit organizations offering help for seniors searching for or currently residing in an assisted living community. These organizations can also provide assistance in a number of other eldercare services such as geriatric care management, elder law advice, estate planning, finding home care and health and wellness programs. To see a list of free assisted living resources in Kenmore, please visit our Assisted Living in Washington page. Kenmore-area assisted living communities must adhere to the comprehensive set of state laws and regulations that all assisted living communities in Washington are required to follow. Visit our Assisted Living in Washington page for more information about these laws.